This morning, fog cloaks the neighborhood. I pull out of my driveway and cannot even see the house next door. Every instinct I have makes the situation worse: High beams? No! Their light reflects off the fog and blinds me. Brake and swerve? No! Sudden movements mean cars pile up behind me or I hit the thing beside me. Drive up close to the car in front? No! No, no, no! I read later about a “visibility expert” at Virginia Tech (Ron Gibbons) who devotes his life to the study of how to ensure visibility in fog, snow, or rain. 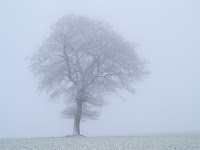 Most every instinct we have when we experience low visibility endangers us. Instead, we must use low beams, tap our breaks as we ease off the accelerator, make no sudden movements, and pull over if we need to. And, perhaps most importantly, choose not to drive at all. All day, I think about things in my future I cannot yet discern. With that horrible visibility, I’m tempted to trust my instincts and react on impulse. I’m tempted to engineer my circumstances (swerving, braking) and stay in charge of my life. Really, I’m just a disaster waiting to happen. What if I slowed down, pulled over, left the car and trusted a Visibility Expert? When God obscures my path, I need not worry. I just trust something deeper than instinct, deeper than my own control. I pull over. I rest. I resist my frantic instincts. Journal: What can’t I see that I need to trust God for? PS: A woman in the English Department commented today that this bad weather wasn’t gloomy, rainy, or foggy. “I like to say that it’s just juicy outside,” she says and smiles. I love that! Yesterday, Barnes and Noble slates my daughter to perform a piano piece as part of a fundraiser for the Music Academy. Neighbors come, cameras focus, and parents beam. But when it is her turn to perform, my daughter bursts into tears and freezes. She cannot even approach the piano. Instead of forcing her onto the piano bench, we gather up her blue puffy coat and the sheet music in her red tote bag and travel home as fast as we can. She slumps into the house and says over and over again, “I couldn’t do it!” She cries and falls onto the couch. She writes apology notes to the neighbors and her piano teacher. And then something beautiful happens. The neighbors send messages that they went to the event to support her, and it didn’t matter whether she performed or not. She could turn away from a thousand stages, and they’d still come every time. My daughter, not her performance, mattered. Her piano teacher calls to tell her that learning the piano isn’t about performance. She tells my daughter that she can choose when, if, and why she wants to perform at all. Learning the piano has intrinsic value as an end in itself. The goal was never public applause, flashing camera bulbs, and bragging parents. My daughter nods with understanding. She wipes her face and remembers that she loves to make music. And I remember the gospel truth with every comforting phone call: it was never about performance. God’s love and favor are never dependent on my good performances. The sooner children learn this, the more they might relax into the freedom that comes with being unconditionally loved, accepted, and valued. I ask my daughter for permission to tell her story. She says, “Sure, Mom!” It doesn’t bother her anymore. She knows now that it’s never about performance. And it isn’t a public failure after all. Journal: Am I tempted to believe my worth is in my performance? Yesterday, this little girl (the one who lost her first tooth) brings home a homemade bird feeder. She announces that the bagel was “a rotten one, leftover from her teacher’s kitchen,” and the birdseed and spread cannot be eaten by humans. We hang the bird feeder on the winterberry bush. And we wait. We wait, wait, and wait some more. I read somewhere that it takes backyard birds a few days to find a new feeder. All day today, we stop every few minutes and glance out the kitchen window just in case a bird has arrived. We talk about who might be the first to catch sight of that first little bird. No birds yet. But the desiring of them, the wait, delights us. We remember another wait, last April, for a hibernating turtle to emerge from underneath our deck. It feels just like that, this waiting, and we love it. It feels like the wait for a first loose tooth. I want to construct more apparatuses designed to teach me the beauty of hope. A backyard bird feeder reminds me to hope today. I wait patiently with my daughters, peer into the landscape ahead, and keep our longing alive. Tomorrow might be the day! Journal: What am I hoping for, and how do I keep my hope alive? Last night, at the weekly game night we host for graduate students, a friend of ours makes homemade donuts. Give this man some flour, and he can make anything. Last month, he invented the most amazing pizza crusts, and before that, he offered everyone crêpes that we dusted with powdered sugar and lemon. While everyone else plays, he works diligently in my kitchen, telling jokes and commenting on the day’s news. I observe, discussing everything from photography to physics. When the donuts finish frying in oil, he plates them and walks around like a waiter to deliver the treats to folks in the basement, in the living room, or anywhere they happen to be hanging out. My husband and I wake up to the lingering smell of fried food. That deep frying permeates even the bedspread, even the pillows. When the coffee’s made, I feel like I’m in a southern grandma’s warm kitchen. The donuts are long-gone, but the kitchen still remembers. The donuts were simple pleasure, a blessing from a friend. All morning, I think about what it means to be a blessing to someone. I think about what I can offer to nourish another person–physically, emotionally, spiritually. What simple pleasures might I bring? May that blessing permeate deeply, leaving a pleasing aroma. Journal: What can I offer today? Today, I remember this quote that I read almost 15 years ago in a little book called, Disciples are Made not Born, by Walter Henrichsen and Howard Hendricks. The authors claim that “every problem we have is related to our view of God.” It was the kind of sentence a person underlines and then rewrites in her favorite journal by her bed. It’s the kind of quote to repeat to yourself when you’re thinking about everything that’s going wrong in your life. I remember it because I have received multiple emails from the English Department entitled: EMERGENCY MEETING! to “update us on the financial situation.” The budge crisis affects all of our jobs, and I have no doubt that the purpose of this meeting will confirm our fears. I look at these emails and ponder the meaning of the words “emergency” and “crisis.” Then, I restate the truth: Every problem I have is related to my view of God. Can this really be true? The quote argues that if we have a big God, we have small problems. If we have a small God, we have big problems. What kind of God do I have? Living with flair means our hearts stay steadfast, trusting, unshaken, and fearless. We have a very big God. Journal: If I have a problem today, how does my view of God change this problem into a possibility? I’m following the story of a friend of mine who has donated half her liver to a friend. Today, I read a post by her husband in which he describes the “throw away moment” when they met the neighbor, Suzanne, who–18 years later–would send out a plea for a liver to save her mother’s life. “There is a lot to this story, and I’m the first to admit I’ve missed much of it. And I’m sure I’ll miss much of the story to come. It’s hard to see from my vantage point. But that doesn’t mean that I’m not overcome by the little bit of the story I manage to grasp: that somehow, on that humid August night in 1993, something was going on that was bigger than me. I don’t have to grasp it in order to marvel. I don’t have to subdue it in order to worship. There are no throw away moments in history because there is a Playwright. And even if you miss virtually all of the connections in your story, you can still stop to thank God for those few moments you see, and, most of all, to thank him that there is a Playwright. All morning, I marvel at what I cannot grasp: today I will have hundreds of insignificant moments that God orchestrates into some grand story–bigger than me, bigger than us all. I might not get to read the story now or even in a decade. But there’s a Playwright. So that means I have no insignificant–no throw away–moments. Journal: What insignificant moments have I seen turn into marvelous displays of some greater story? This morning, I recall the prayer of the prophet Habakkuk. I normally don’t think about Habakkuk on the walk to school (who would? ), so I wonder if God’s trying to tell me something. When it’s dreary outside with fresh snow piled up (again) on the already barren landscape, I become fascinated by the gnarled vines, the black branches that make offerings of emptiness, and the frozen expressions of leaves trapped in ice. Nothing moves. Nothing dances here. The vines encircle desperately like a snake coiling upon prey. It’s nearly impossible not to give in to that icy invitation to admit defeat and surrender to winter melancholy. As I look up into the distance, I see that we are literally standing on the heights–on one of the highest hills in our neighborhood. Up ahead, another hill (our mountain) delights us with that bit of snow. I realize I wanted to stay and snap pictures of the gnarled vines, the stark forest. But I couldn’t. Not today. Not with the sun shining on us and Habakkuk’s prayer in my heart. I look up from my circumstances–no matter how barren–and rejoice in a far greater view. Journal: In empty seasons, how can I rejoice in God? It’s a snow day in our county, and the children and I make cookies to frost. The girls crowd around me and eagerly reach for the blender whisks after I’ve made the vanilla frosting. I hand the whisks down, and I purposefully arrange some extra frosting on each one. When my daughter licks the blender whisk, I see her searching out every last drop. When she hands it back, it’s as if it’s been cleaned in the dishwasher. I want to search out the beauty in this day, relishing every part. God hands me the whisk, and I sit back and enjoy it. Journal: What good thing has come my way today? I’ve never roasted beets before. I scrub off the dirt, chop off the stems, and roast them for an hour. When cooled, the beets slip right out of their skin. I slice them in quarters, toss them with fresh ginger and olive oil, and finally sprinkle a dash of salt. I’m amazed that roots, buried deep in the darkness, can produce such vibrant color. That deep red paints everything: my fingers, the counter tops, and the kitchen sink. This winter kitchen has bright red flair! One would never know, just by looking at those old roots, what a beet can do. No other vegetable has such color. I learn that, at first, the leaves were the only parts of a beet considered edible. The roots, tossed aside and wasted, weren’t enjoyed as they are today. But now we know differently. The beet root, beautiful and vibrant, nourishes. The parts of us we toss aside–viewed as waste–or bury deep await God’s use: beautiful, vibrant, nourishing to others. Journal: What skills do I toss aside, thinking they have no use? On Saturday mornings in my household, we all pitch in to clean and reset the house for the next week. Children dust and organize rooms. I scrub floors and toilets, fold the laundry, and change all the bedding. Then he takes his smart phone with the Grocery IQ application and does all the coupons and grocery shopping. He’s so detail-oriented that he can make the house sparkle, and he’s so good with fast math that he saves us a fortune each week by memorizing sales and matching coupons to what’s on sale. He’s mastered the art of weekly grocery shopping. He calls it hunting for our food. I’m thankful that my daughters have a father who cleans house and goes to the grocery store. There’s something profoundly manly about this, and it makes our marriage have flair. Journal: Is there something I’m not doing because I think it doesn’t fit a traditional gender role?